Last night, I was back at my favorite culinary destination- City Walk. I can’t believe, I am visiting City Walk for the third time in 10 days. Love the diverse food offering in City Walk, no wonder, I keep going back again and again. 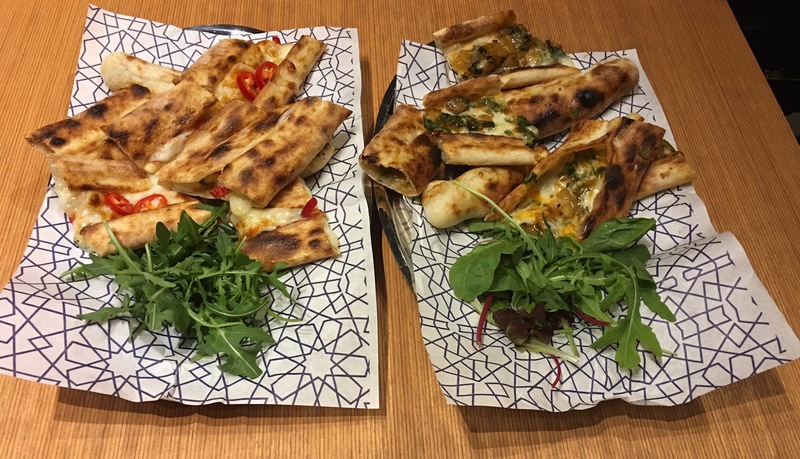 Babaji is a Turkish ‘Pide‘ restaurant from London. It opened its first international eatery in City Walk, Dubai a few months back. This sought-after Turkish restaurant from London is fast gaining popularity in Dubai for its delectable food. When we visited the restaurant yesterday, it was almost full. Babaji is a spacious restaurant that has Turkish inspired decor. 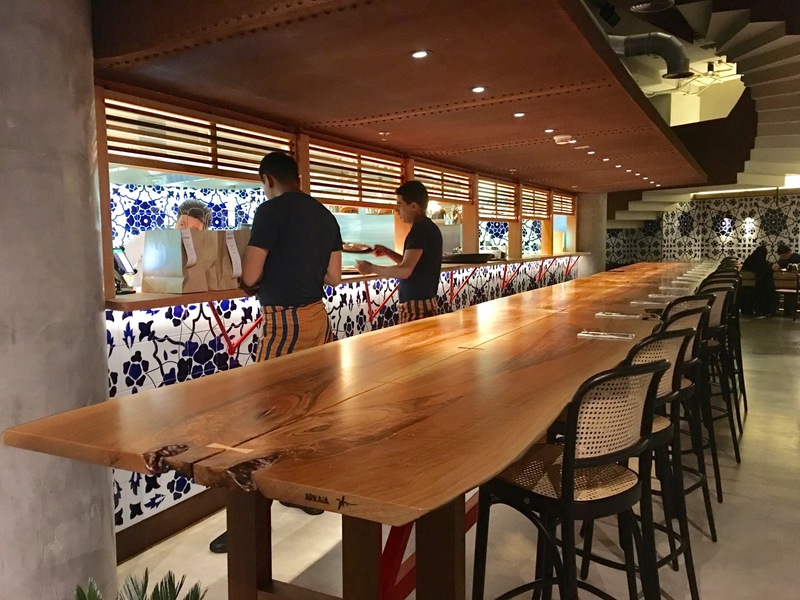 This casual dining eatery has a modern decor with dim lighting and comfortable seating area. They have an open kitchen concept, with the Pide oven taking the pride of the place. At Babaji, the menu focuses on Pide. Turkish-style pizza is called Pide(pee-deh). Pide is believed to date back to Ottoman times. Pide is a kind of bread made with leavened dough that’s flattened out with the fingers to give it a boat-shape. Pide originates from three Turkish regions: The Black Sea, Aegean Sea and Middle Anatolia. It is a great example of Turkish regional cuisine known for its rich flavors. Pide comes with a variety of toppings like ground lamb or beef or cheese and veggies. Ten kinds of Pide are served from the brick oven of Babaji. The menu of Babaji is simple and ordering is easy. It offers Pide, mezze, soup, salad, grill, desserts and drinks. We started off with drinks. They serve their signature mocktails, fresh juices, Ayran, iced coffee & tea, soft drinks and hot beverages like coffee and tea. We ordered two of their classic mocktails- Bodrum Punch and Quiet Storm. Both the drinks were super tasty and refreshing. Tomato & Walnut Salad had small bits of tomato and walnuts in a pomegranate dressing. Perfect salad to start a meal. Kisir is the Turkish bulgur wheat salad. It had bulgur wheat, tomato, lemon, mint and garlic in a tangy pomegranate dressing. 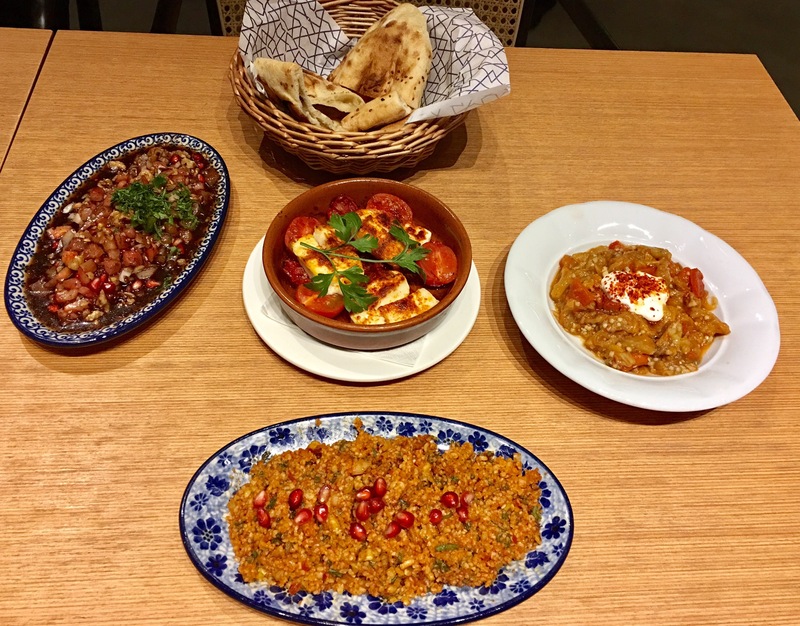 As we love bulgur wheat, we loved Kisir at Babaji. Roasted Eggplant with red pepper and yogurt had a delicious smoky flavor. And made a great combo with warm flatbread. Oven Baked Halloumi was a standout dish and a definite must-try at Babaji. Oven baked halloumi with Datterini vine tomato and oregano tasted heavenly. Bread Basket consisted of soft and warm flatbread that was freshly baked in-house. Pide Patates was comfort food at its best. It had a scrumptious combination of potato, Izmir tulum, kasar cheese and red chilli. Temel Reis was Pide stuffed with spinach, kasar cheese, onion and red chilli. We liked this Pide too. Pistachio Baklava was rich and had an authentic Turkish taste. It was served with Turkish ice cream. We loved the Baklava and highly recommend it. Kabak is a healthy dessert made with pumpkin, walnut and clotted cream. This was the first time that we tried this dessert and it didn’t tickle our taste buds. 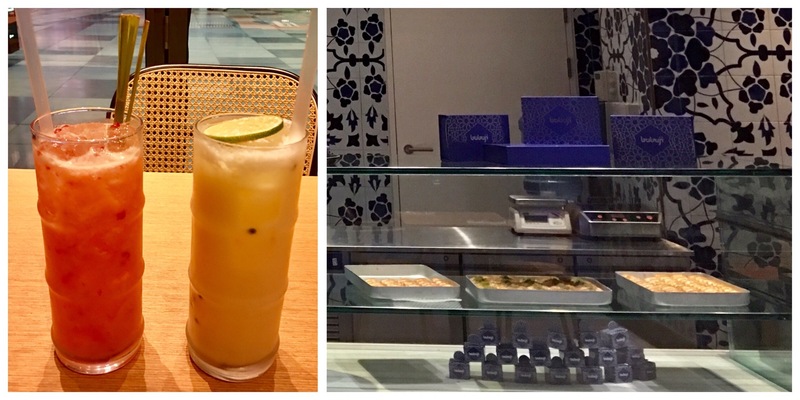 We ended our dinner at Babaji, with a cup of flavorful Turkish Tea. Overall, we had an amazing dining experience. The food, the drinks, the service and the atmosphere was great. The portion-size is small and prices are on the higher side. When I am hit by Pide cravings, now I know where to go.